Marie Laveau is a Marvel character that is appears in the adventures of Doctor Strange, Brother Voodoo, and Blade. She is depicted as both an ally and adversary of Strange. Marie Laveau is based off of an actual voodoo priestess who lived in New Orleans. While the MCU has not touched much on the Supernatural outside of Doctor Strange it does appear some of these characters could begin to make appearances. Marie Laveau is mentioned in Episode 3 Season 1 of Cloak and Dagger. Marie Laveau is a famous voodoo priestess from New Orleans. The beautiful Creole woman was born in 1801. She acted as a nurse in the battle of 1812. She married Jacques Paris until he disappeared. Then Christophe Glapion whom she had 5 children. At some point Marie meets the hougan John Bayou (aka Mambo Sanite Dede) who initiates her into voodoo magic. During the primary part of her life Marie amasses considerable wealth, mystical talents and political power. Her name is connected with social causes like fighting slavery and opposing religious oppression. 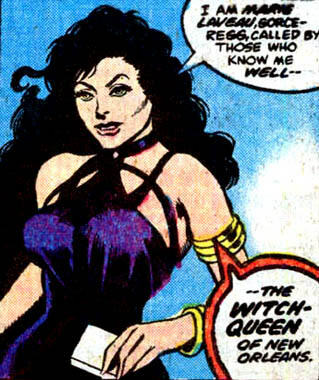 Over time though, her name is also tied to many dark deeds and magicks as well. In any case it difficult for anyone to sort the truth from the legend. In 1881 Marie is reported dead, however in fact she survived and continue to live on. Marie's seeming immortality is caused by a potion initially created by the wizard Cagliostro. The potion grants Marie immortality but does not stop her aging. Marie begins to seek out the means to change the effects of aging in the potion and settles upon Vampiric blood. In the 1900s she captures Dracula himself and uses his blood to restore her youth. In modern times Marie once again became active. She is a frequent adversary of the new head voodoo practitioner Brother Voodoo and Doctor Strange. She is captured by the zealot Silver Dagger who wants to target Doctor Strange. Silver Dagger uses her as bait. Marie escapes and has the ability to kill either Strange or Silver Dagger. She chooses to take down Silver Dagger and earns the leery respect of Strange. Doctor Strange becomes an antagonist of Marie when he destroys Earth's vampires. Marie needs vampires to keep her youth as part of her tweak to the Cagliostro potion. She convinces Captain Marvel back in time to 1784 to acquire the blood of Dracula however once he returned to the present the blood was destroyed by Strange's spell the Montesi Formula. Marie continued to search for any signs of vampirism and managed to find one in a surprising place. Doctor Strange had killed his brother Victor Strange and then used a variety of magic to bring him back to life. Victor was comatose but alive and to Marie Laveau's surprise had a hint of vampirism. She uses the awakens Victor. She kidnaps Victor and Morgana Blessing and threatens to harm them if Doctor Strange does not hand over the Vampiric Verses. The Vampiric Verses are a spell that would bring back vampires. Doctor Strange refuses, seeing that it would cause great harm to the world. Laveau uses the golden arrow of Eros to make Victor love her so she can control him. Victor and Marie then battle Brother Voodoo, Doctor Strange and other heroes as they attempt to awaken Varnae. The long dead, Varnae was thought to have been the first of the vampires. Marie tried to control Varnae but failed and the ancient vampire went around the world creating new vampires. Blade eventually found and killed Varnae but not until many new vampires had been created. Varnae resurrection greatly weakened the Montessi Formula spell and soon Dracula was recreated. Marie seemingly perished in a battle with Brother Voodoo. Marie had joined forces with the vampire villain Deacon Frost to take control of New Orleans underworld. The two were opposed by Brother Voodoo and Blade. She used the voodoo gods called the Loa to create powerful zombie warriors. Brother Voodoo intervenes with the Loa and convinces the serpent god Damballah that Marie has lost respect for the gods. The god agrees and crushes and seemingly kills Maria Laveau. As of yet there has been no mention of Marie Laveau in the MCU.